Occasionally I look at a menu and find a dish that sets off a craving. It happened to me this past weekend when I spotted a roasted beet tower on the appetizer menu of a restaurant where I was enjoying a sunny Sunday afternoon on the patio. I envisioned layers upon layers of red, golden and bulls blood (pink) beets. What showed up was three very thin beet slices, each separated by a solid inch of an avocado and tomato mixture. Don’t get me wrong, I love avocados, but when I was expecting roasted beets, a plate of guacamole was pretty disappointing. Lucky for me, the folks over at Clarkson Potter recently sent me a copy of the new Everyday Food cookbook – “Fresh Flavor Fast.” I subscribe to the Everyday Food magazine and buy their books because they have simple, get-down-to-business recipes. I may love spending hours on a dish on a quiet Saturday afternoon, but Monday through Friday, I need realistic recipes that take into account the maybe 30 minutes I have to prepare a meal. Fresh Flavor Fast is everything I love about Everyday Food. It’s packed with new ideas to get you out of the cooking ruts that are so easy to get into when speed and simplicity are top priorities. 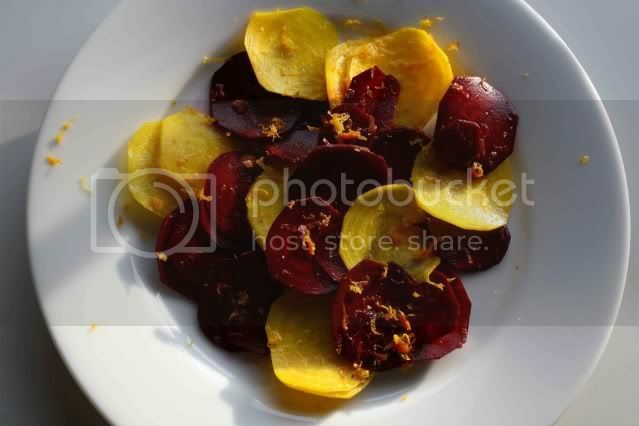 I wasn’t expecting a side dish or salad to be the first recipe I made from the book, but upon arriving home from my disappointing roasted beet tower experience, I opened up the book and found this recipe for shaved beet salad. The salad took no more than 10 minutes to put together and totally satiated my beet craving. Raw beets are not for everyone so make sure you slice them thinly. 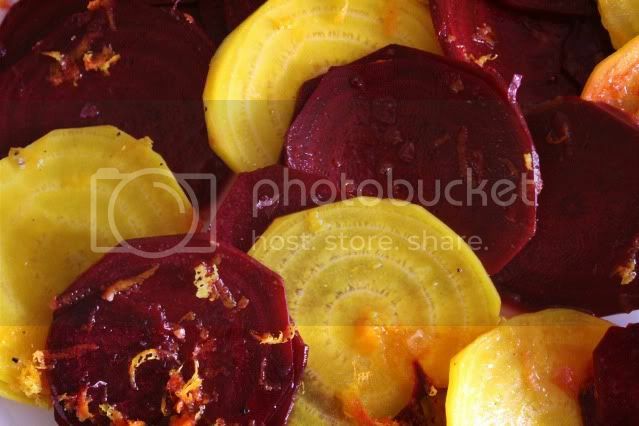 I used a mix of red and golden beets, but feel free to use all red or any combination you prefer. If you are using a mix, make sure you toss them with the dressing separately or the red beets will turn everything else red too. Whisk together the zest, juice, vinegar, oil and sugar and season with salt and pepper. Toss the beets with the dressing. If you are using different colored beets, toss each color separately so that the red beets don’t bleed their color on the lighter beets. Arrange beets on individual plates and serve. I'm only just learning to like beets, so I probably won't be making this one anytime soon. I do know they're good with orange, though, and I absolutely love the colors! I am an Everyday Food subscriber and a beet lover too, so this is right up my alley. I usually serve my beets roasted then chilled with bleu cheese but this looks like a delicious change. Beautiful salad! I can't wait for the Farmer's Market and fresh beets!!! Ok, ok. I guess this means I need to give beets another try. Nice colors in the salad. Oh, I'm sure this is delicious and I will have to try it! Very good recipe and I thank you for it! Love the colours! Great flavours. Ahh! Scroll down some more, and I find more beets! You're the best! Have you tried the golden beet salad at whole foods? I've been meaning to recreate it but always end up stopping by whole foods for lunch and getting them then. Instant gratification.